I only recently recognised that the values that RootsMagic puts into the Relate1 and Relate2 fields of the PersonTable when the Set Relationships function is applied are more useful than merely codifying the relationship (e.g., see Relationships). Apart from special cases for Self and in-laws, the sum of the two values corresponds to the degree of consanguinity (see this Wikipedia article). For example, the degree of separation in consanguinity is the same from you to your g-g-grandparents (4) as it is to your 1st cousins and your great-aunts and -uncles and your grand-nephews and -nieces. It strikes me that the consanguinity degree might be an interesting, if not useful, basis for color coding. Indeed, it is so easily implemented, I wonder why it is not an option for the Color Code People tool or that consanguinity is not a criterion for finding people and creating groups. Example of color coding by consanguinity degree. 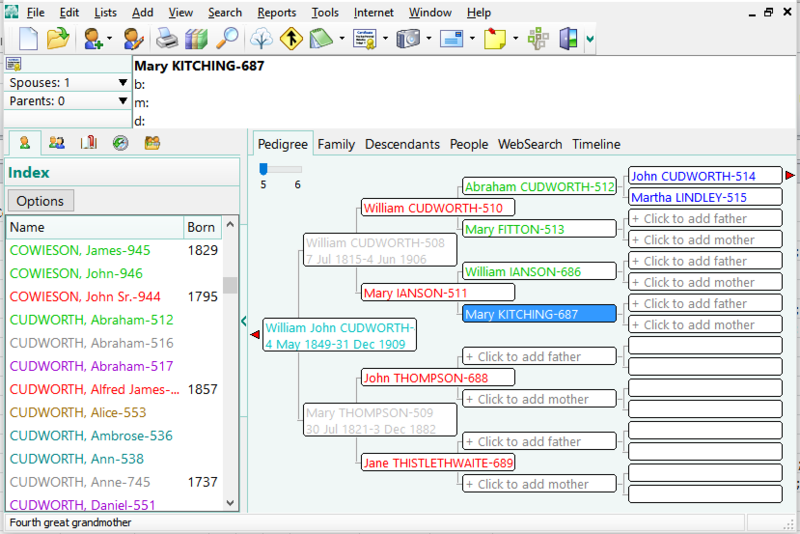 Note that each generation of grandparents gets a different color, a difficult task in RootsMagic. ColorCode-byConsanguinity1.sql Consanguinity degree mapped directly to RootsMagic color code values. ColorCode-byConsanguinity2.sql Consanguinity degree mapped via lookup table to RootsMagic color code values so that the closest are brightest and farthest are darkest. ColorCode-byConsanguinity3.sql Consanguinity degree mapped via lookup table to RootsMagic color code values so that the closest are darkest and farthest are brightest. Consanguinity color coding by script#. 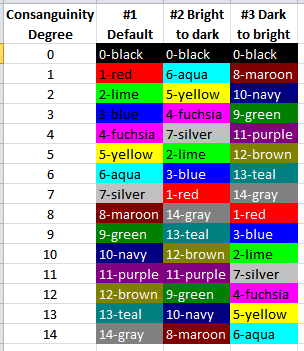 I used a spreadsheet to sort the colors by brightness and hue and to generate the SQL INSERT statements that create the table to map the consanguinity degrees to color codes for versions 2 and 3. ColorCodeDistances.xlsx You could adapt this spreadsheet to color code consanguinity as you see fit and edit a script accordingly with the revised set of SQL statements.